When Art meets Tech, then the life becomes different. Here is one of those examples? 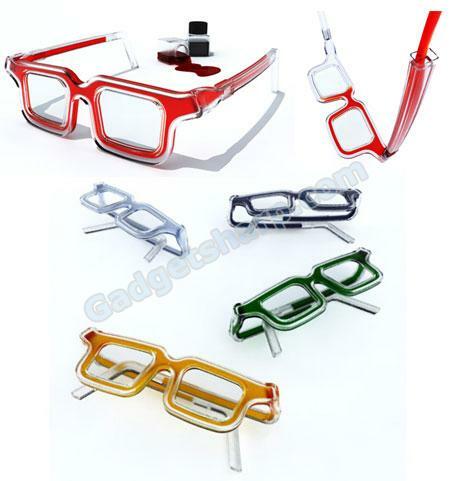 10 super cool and geek glasses designs. 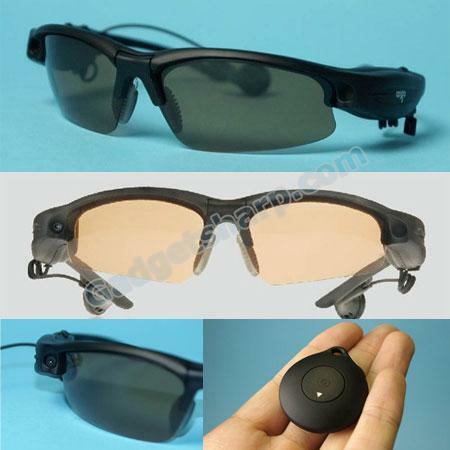 We have super power spy glasses which come with a 1.3 megapixel camera, an MP3-player, 2 GB of internal memory, a USB port and a wireless remote control. 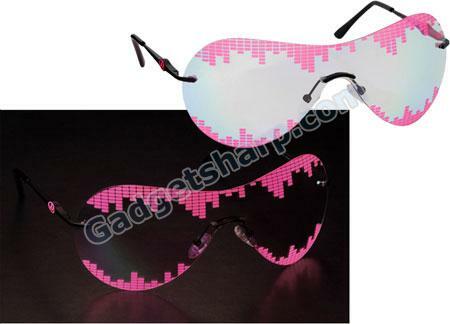 OR Equalizer Night Glasses which designs only for night, lighting up under black neon lights. 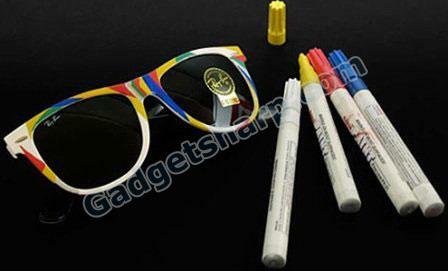 I believe, with those cool and creative eyewear design , you will definitely stand out of the crowd. The glasses themselves don?t need power to block the sun?s rays from your eyes. That?s power-free. The SIG, or ?Self-Energy Converting Sunglasses? are quite simple. The lenses of the glasses have dye solar cells, collecting energy and making it able to power your small devices through the power jack at the back of the frame. ?Infinite Energy: SIG? I guess, with that glass you won’t be worried wether your iPod will run out of power when you are lying on the beach. Watsget glasses look like regular sunglasses during the day and then light up under black neon lights in clubs. Hence… Watsget called itself is essentially dedicated to the conception and design of night glasses. DIY, color-on-it-yourself fashion items have had a resurgence over the last few years, and Ray Ban is the latest company to get in on the trend. 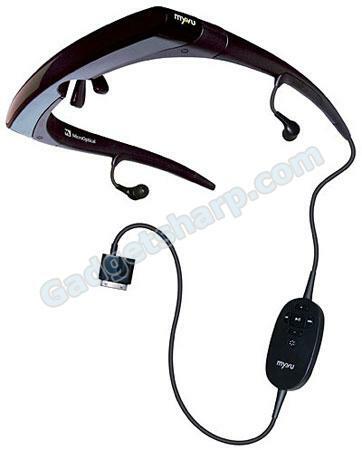 Aigo Camera sunglasses MP3 F566+, come with a 1.3 megapixel camera, an MP3-player, 2 GB of internal memory, a USB port and a wireless remote control. The device weighs just 45 grams. Otas says the internal memory is enough to store up to 20,000 photographs. The highest picture quality possible is 1280?1024. Music files in MP3 or WMA formats are supported. According to the manufacturer, 2 hours of charging is enough for 6 hours of music playback. Priced at $120, the sunglasses are available in Japan. 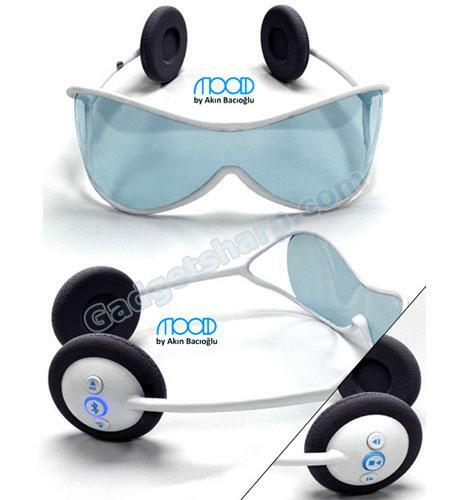 Mood is a multifunctional accessory for your music, phone and eyes. Walk on the crowded streets and still engage in crisp communicate via the headset thanks to the high quality microphone with noise canceling tech. A bright LED light comes to life when you sync it with your GSM phone or comp. For those interested in the player part, there are three dedicated buttons (on one earpiece) for navigating the songs and three buttons (on the other) to manipulate the volume and Bluetooth on/off. Can’t find a glass cloth when you glasses is dirty? End up using you T-shirt? Check this self-cleaning glasses. 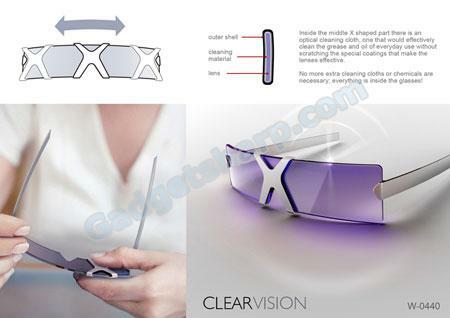 The middle support area of the glasses receives also a cleaning function. Users can simply slide the middle part over the left and the right lenses to for a simple and effective cleaning operation. No more extra cleaning cloths or chemicals are needed; everything is inside the glasses! These RGB glasses just may be the next hated trend. It?s completely hollow to be filled with ink. The structure of the RbG glasses has an internal channel where the colourful ink passes through, painting it with the colours you desire, allowing you to have a different look every time you want. Made in plastic with a flexible part in the arm of the structure. Filled with water based ink. DO WANT! 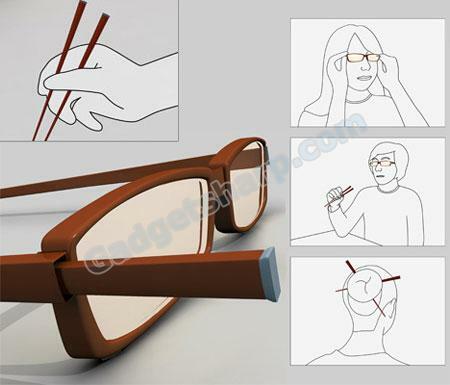 The STIX eye wear are modern glasses that hold chopsticks for the person on go. The hollow plastic frames offer casing for the stainless steel tipped utensils. They can be easily washed or whipped off, and the ends of the glasses are open to eliminate bacteria build up. Prescription lenses are expensive so it?s not often we can afford more than a single pair. Unfortunately that means being tethered to one frame style. Switch Glasses gives you at least two options to fit your mood and lifestyle. 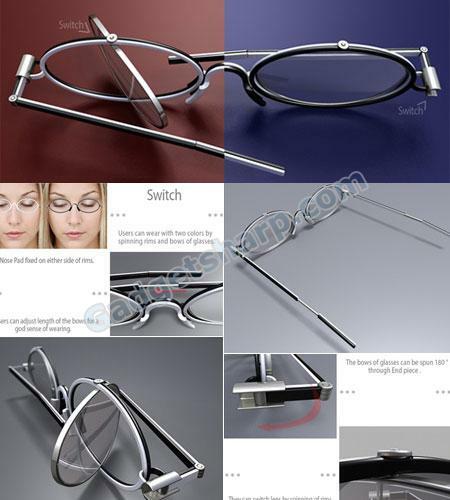 The design adds pivots and hinges to the arms and lens of a pair of glasses. By flipping them around, you can take advantage of two different frame colors. Maybe one for work and a funkier one for a night out. video goggles can be plugged directly into your video iPod and project a virtual 24 inch TV directly in front of you - no extra cables, adapters, or bulky power-packs necessary. 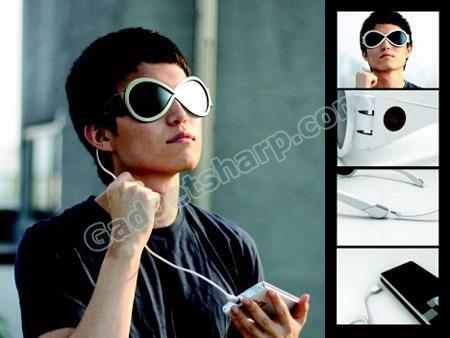 These goggles don’t even have batteries - they draw power directly from your iPod. Don’t worry - they draw so little power, you probably won’t even notice it. A 5th gen 30 Gigabyte iPod Video can run more than 2 hours, while the 80 Gigabyte iPod Video can run more than 4! Watch your favorite episode of The Office, catch up on Lost, or even watch Blade Runner for the upteen millionth time - whatever you want! Just please don’t wear them while driving or operating any other heavy machinery.